Understanding the structure of knowledge and mapping how the different knowledge branches or academic disciplines are related is an old ambition. One recurrent theme is the collaboration network among researchers, publications and knowledge disciplines. Much like early world charts, maps of science provide an overall visual perspective of science as well as a reference system that stimulates further exploration. Maps of science have been mostly derived from citation data. Citation analysis has been the source of inspiration for academics studies and practical applications (notably the PageRank algorithm behind Google’s search engine). However, since scientific publications are predominantly accessed online, and scholarly web portals routinely log the interactions of users with their collections, the resulting log datasets are worth exploring as an alternative to citation datasets. Over the course of 2007 and 2008, a group of researchers from Los Alamos National Laboratory collected nearly 1 billion user interactions recorded by the scholarly web portals of some of the most significant publishers, aggregators and institutional consortia. The resulting reference data set covered a significant part of world-wide use of scholarly web portals in 2006, and provided a balanced coverage of the humanities, social sciences, and natural sciences. A journal click stream model, i.e. a first-order Markov chain, was extracted from the sequences of user interactions in the logs. 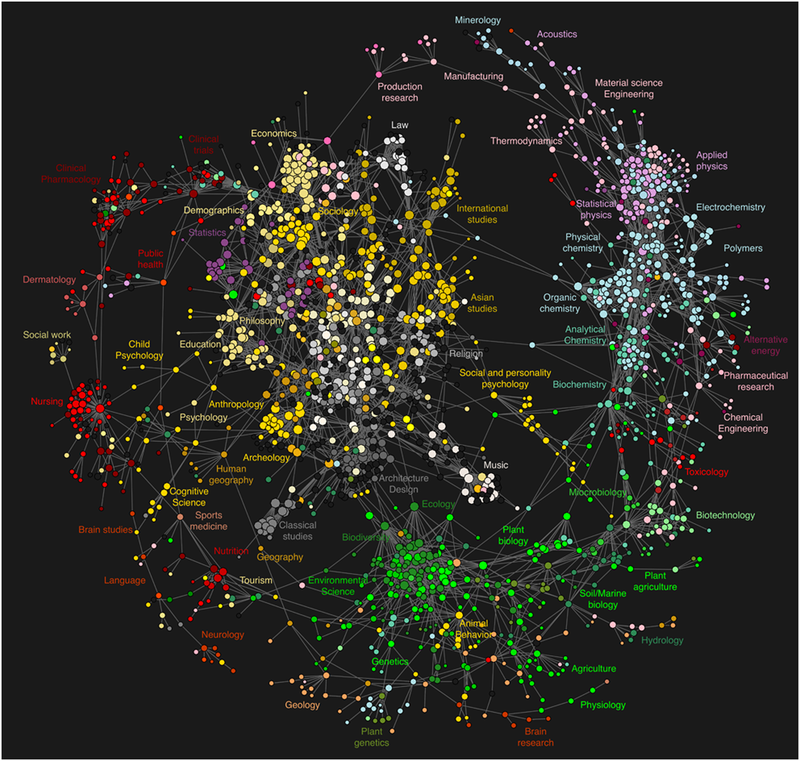 The resulting model was visualized as a journal network that outlines the relationships between various scientific domains and clarifies the connection of the social sciences and humanities to the natural sciences. How inscrutable are Knowledge’s Ways! Previous What is it like to be a Linotype?